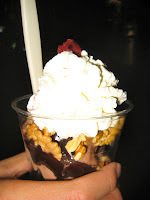 YummyInTheCity: Van Leeuwen Ice Cream - Yay for East Village Truck! Van Leeuwen Ice Cream - Yay for East Village Truck! Now that Van Leeuwen has a new ice cream truck parked on 10th and 2nd, Chikalicious and 16 Handles better be scared. If not for their entrance I would have gone for my usual Vanilla Bean Chikalicious sundae fix. Van Leeuwen's artisan gourmet ice cream is wonderfully rich and creamy with a super smooth taste. Made from fresh dairy from Lewis County, New York, Van Leeuwen uses only superior ingredients in its gourmet ice creams. You can be sure the cow your ice cream came from spends its life happily grazing on pastures the way nature intended. $3.95 gets you a small scoop of ice cream - but rest assured the small isn't quite as small as many of the other purveyors of gourmet ice creams dole out. One small gianduja (chocolate and hazelnut) was big enough to feed me and my boyfriend. For take home - a handpacked pint is $8.00. What a great addition to the East Village!